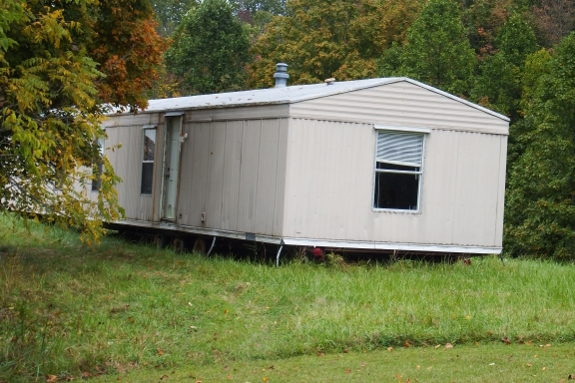 So what did we look at when we started considering potential used mobile homes? Given that the abodes are technically wheeled vehicles, I turned to used-car know-how. First on the agenda --- finding one as young as possible within our price range. Next up --- potential trouble spots. Roof leaks and bad floors are two of the most likely flaws of a used trailer. I go into this in much more depth in Trailersteading, so I won't bend your ear again here. 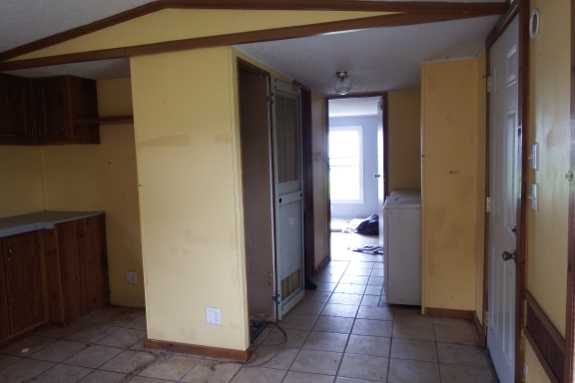 As when hunting an ugly-duckling property, it's just a matter of figuring out what you can live with (and fix) and what you can't. In the end, Mark and I got lucky. Our septic installer is also a trailer mover, and he knew of a 1993 Skyline Sabre less than a mile down the road from our new place. There are some obvious trouble zones we'll have to fix --- a few holes in the floor, lack of a furnace, pipes that likely burst when the space sat unheated for three years, and single-glazed windows being the worst of the downsides. But the trailer was a steal for $1,500 and will be very cheap to move given its proximity to the eventual destination. Success! Score! Now you have a home to go with your new property, and all within budget. I've asked this before, and you may not know the answer yet - but are you going to be able to connect to the grid in your new location? Bought my first mobile home in 1980. At the time, HUD changed the regulations to require that mobile homes have copper wiring in them instead of aluminium because aluminum wiring was prone to fires. I'd suggest that you look at those type of things to make sure you're not getting a potential fire hazard. I wonder what your projected tax savings are over say 10 years. Cheap land, cheaper house? How does this compare with your nearby 'neighbors' in their 'conventional' houses? Hard for the tax collector to really bite you??!! Especially if you can sell produce from the side of your road! Doesn't look like the nineties? I'm getting more of a seventies vibe. 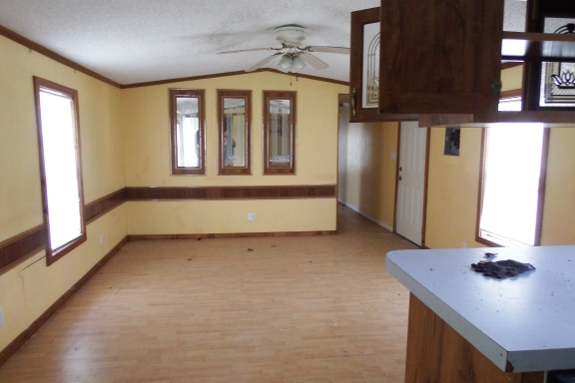 What with the yellow and brown, the hanging cabinet and the lights/ceiling fan combo. Nothing some DIY-ing can't fix, I'd say. And you can't beat the price. Is it common for mobile homes to have such small windows? Practically all the houses I've ever lived in had wall-to-wall windows. Trailers do tend to have really small windows, and also really crappy ones. That's top of my own upgrade list --- adding more on the south side and swapping out the single-glazed for double. I have a feeling large windows just aren't compatible with the rigors of a move. It very much depends on the kind of window and how the windows are fixed to the structure. If you look at modern touringcars and city buses you will see very large windows bonded directly to the frame. These are actually part of the load-bearing structure. That's one reason why these windows don't open. 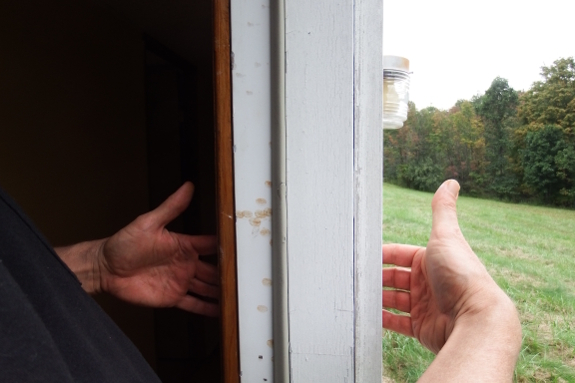 Of course windows that can open and window frames that are only fixed with a couple of screws and PU-foam aren't as sturdy as a pane of glass bonded straight to the structure. So I would definitely advise to do the replacement after the move. You might want put a 2x10 header above the window, and maybe even a complete frame of 2x10 around the larger window to support the loads. According to the samurai carpenter [video], it's best to use glulam beams as headers since they don't shrink as much. Also, I'd like to say that while there are definitely good things that have come from the seventies, that brown/yellow combination isn't one of them. Tastes differ, of course. My apartment had (emphasis on the past tense) several purple walls when I bought it. I will say the more modern trailers is they lack the style of 60's trailers, back when they wanted them to look like they were mobile, and possibly going fast! Oh, the rounded corners, the two tone siding, the horrid green shag (or red velvet!) the bubble, smoke windows at the tongue end! That is a heck of a deal for 15 hundo. YES I would upgrade wiring as need be. YES I would upgrade to windows that are not paper thin. We did that in our 1950's conventional frame home and it is hands down the best thing we did. The AC can keep up, the heat stays in, and living near a road the NOISE is vastly reduced. Best of luck to ya, look forward to updates!